Pacific through various roundabouts to the SC Municipal Wharf. Disembark from the wharf. Right on Beach Street. Bear left on 3rd Street. Right on Riverside – over Riverside Bridge. Right on San Lorenzo Blvd/East Cliff. Left on Ocean Street. Right on Soquel. Right on Pine. Right on Seabright. Left on Murray. Right on Lake. REGROUP- Palomar at the SC Harbor. Head east on East Cliff. Straight onto 7th. Left into upper harbor – onto Arana Gulch bike path. Up the hill, towards Broadway. Right on Sumner. Left at Hanover. Right on Seabright. Left on Soquel (from the new Bike Box!). Right on Pacific. A few times around the block. End at 703 Pacific Ave! 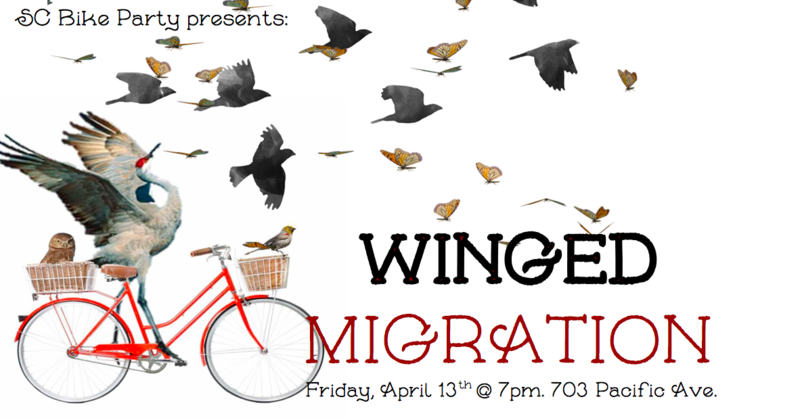 Let’s rock as a flock of winged creatures and celebrate seasonal migrations. Winged migration is natural – butterflies, birds, and even bats travel long distances to accommodate for seasonal shifts, lack/abundance of food, and to journey to breeding grounds. So, don your wings, whether literal or metaphorical, and flock together with bikes of a feather. Our dope (wing) beats will fill the night air as we celebrate the changing seasons and the natural desire to set off to parts unknown. Boundaries, borders, streets, and walls cannot hold us!